We had a lot of fun going sledding with Grandma and Grandpa and Doug, Autumn and Braxton. Even little Kyson got to go down a couple of runs. Gavin loved it and would say "Again!" as soon as he got down to the bottom of the hill. His favorite was riding on Braxton's back. Kyson has found a new toy! He loves the piano. He looks like such a big boy sitting in the chair next to the piano. He gets so excited and pounds away at the keys. Kyson is now 10 1/2 months, and coming up his one year birthday soon! It amazes me how fast the time has gone. He is such a good baby. He is generally very good, unless you take something away from him that he wants. Then he screams bloody murder! He is a little jabber and loves to hear his voice. I'm pretty sure he knows two words. "Mom" and "nana" (for bannana). He says "mom" anytime he sees me and "nana" when I give him a bananna. I love bathtime! Gavin and Kyson can sit for hours and play in the tub together. Kyson figued out how to splash water and goes crazy with it! I love these boys! We had such a fun and relaxing Christmas Break. We tried to stay home as much as possible and enjoy the beautiful snow. One morning Gavin wanted to build a train track, so we spent most of the morning putting this massive track together, (and when I say "We" I mean "Me"). After 10 minutes of him playing on it, he said "All done!" and started to put it away. Oh well, I had fun putting it together! Gavin's friend Brielle came over to get Gavin to ride on the sled and play in the snow. 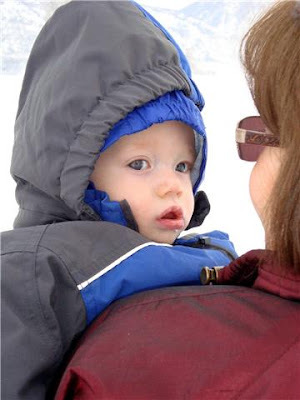 I bundled Gavin up, and sent him on his way, and then bundled Kyson up and went out to watch him. In the short amount of time I was bundling Kyson, Gavin had already got cold and was ready to go in. So poor little Kyson was bundled ready to go, but didn't get to enjoy the snow! Here is Gavin walking in the middle of a snow pile, instead of walking around where it isn't as deep. No wonder he was so cold!